How can I contact the Front Desk? The front desk can be contacted by calling 1-717-334-8804 from 9:00 AM - 10:00 PM EST, Monday through Sunday. You may also contact the front desk by sending an e-mail to battlefieldbedandbreakfast@gmail.com. E-mail is preferable for international customers. Check-in is at 3:00 PM, though we can accommodate a check-in as late as 8:30 PM. Check-ins beyond 8:30 PM can also be arranged by request. Call the Front Desk at 1-717-334-8804 to arrange a late night check-in. Check-out is at 11:00 AM. When is breakfast served? Can I request an early breakfast? Breakfast is served at 9:00 AM daily. You can request an early in-house breakfast from 8:00 AM - 9:00 AM. Any breakfast request before 8:00 AM will be prepared as a To-Go style breakfast. To-Go style breakfasts are generously-portioned cold breakfasts consisting of a yogurt, 2 hard boiled eggs, a muffin, and an assortment of fresh fruit in a to-go container. How much is the required room deposit? For standard overnight stays, the deposit is 15% of the cost of the room, including applicable taxes. For seasonal specials, the deposit is one night's stay. For packages, the deposit will be one night's stay. This deposit is non-refundable. When is the total room payment due? Your room balance will be charged the day before your arrival. 24 hours' notice is required for a booking cancellation. 24 hours' notice is required for a booking cancellation. If you cancel with more than 24 hours' notice, we will email a gift certificate for the deposit value to be used during a future stay. The gift cerificate does not expire and can be transferred to another party if you prefer. If you cancel with less than 24 hours' notice, you are still responsible for the full payment of your reservation. When and why are Extra Guest fees added to a booking? Extra guest fees are added to a booking whenever more than 2 guests over the age of 5 years old are booked in a single room, with the exception of our Swan Cottage. Swan Cottage is already priced to include up to 4 guests. If you book any other room at Battlefield Bed and Breakfast Inn and add an additional guest over the age of 5, our booking system will automatically increase the base price by $25.00 per guest. This fee covers additional housekeeping and breakfast costs for each individual extra guest that you add to a room. If you add a 5th or 6th guest to Swan Cottage, the booking system will also add the same individual fee for those guests. What rooms are Dog Friendly? Are there any limitations on Dogs? Every room at Battlefield Bed and Breakfast Inn is dog friendly. We ask that your dog remain on a leash outside of your room in hallways and common rooms. You are welcome to bring your dog to Morning History as well as Breakfast. We ask that you clean up after your dog outside. We provide complimentary waste bags and an outdoor trash can. We do not charge any additional fees for bringing dogs to Battlefield Bed and Breakfast Inn. Also, we do not have any weight limits or breed restrictions on dogs. Every room at Battlefield Bed and Breakfast Inn is non-smoking. Guests are welcome to smoke outside. We offer several outdoor seating areas with ashtrays, however all 30 acres are available for those that wish to smoke; we ask that you dispose of your cigarette or cigar stubs in the trash or an ashtray to help protect our nature preserve. 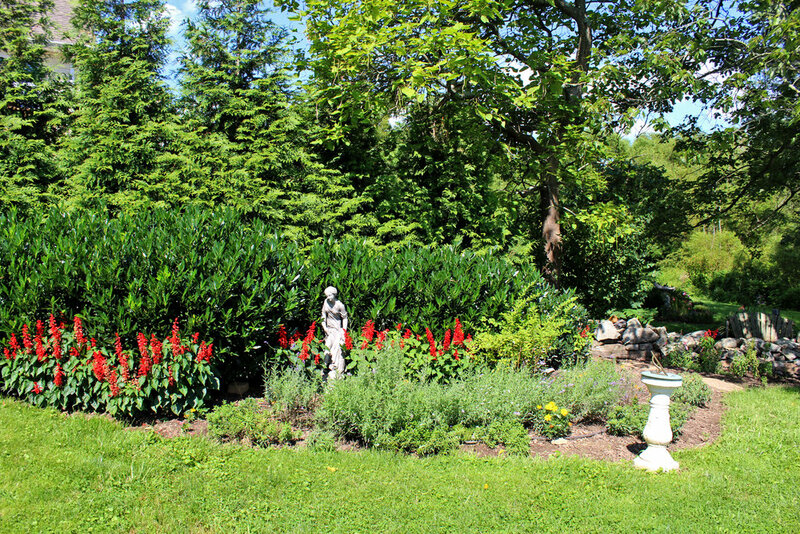 How far is Battlefield Bed and Breakfast Inn from Gettysburg, PA? Battlefield Bed and Breakfast Inn is located on Emmitsburg Road, which turns into Steinwher Avenue in the town of Gettysburg. We are a five minute drive from all of the restaurants and stores on Steinwher Avenue. 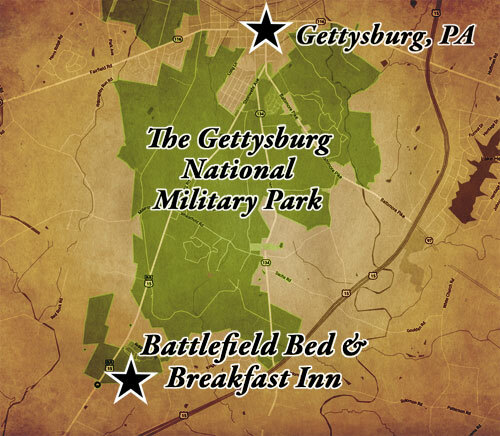 It is a ten minute drive to the Gettysburg National Military Park Museum and Visitor's Center. It is a ten minute drive to Lincoln Square, the rotary in the center of historic Gettysburg, PA.
At Battlefield Bed and Breakfast we are dedicated to protecting your privacy and safeguarding your personally identifiable information. Our main purpose in collecting your personal information is to provide you with a streamlined experience in making reservations at Battlefield Bed and Breakfast. We only collect information about you that we consider necessary for achieving this. Personally identifiable information is only obtained when making a reservation. All identifiable information provided will not be disclosed to anyone unless we are specifically requested to do so. Battlefield Bed and Breakfast does not give or sell to anyone any information we collect on our site. At Battlefield Bed and Breakfast, we take security seriously. When users make a reservation we use every precaution to safe guard it online and offline. Battlefield Bed and Breakfast may amend this Privacy Statement from time to time in order to meet changes in the regulatory environment, business needs, or to satisfy the needs of our guests, properties, strategic marketing partners, and service providers.